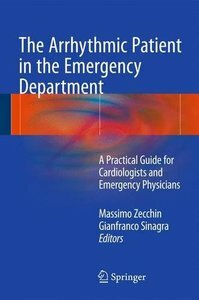 This book is a practical guide to the differential diagnosis and treatment of patients presenting in the Emergency Department with syncope or arrhythmias, including bradyarrhythmias, atrial fibrillation, narrow and wide QRS tachycardias. In addition, clear advice is provided on the management of patients with cardiac devices and possible dysfunction, electrical storm, or a requirement for urgent surgery. For each topic, a literature review of epidemiology, physiopathology, differential diagnosis, and treatment is conducted. Furthermore, practical suggestions are offered for short-term management, e.g., regarding the decision on when and where to hospitalize the patient; these proposals do not replace but rather summarize or integrate the current guidelines. The book is designed both for emergency physicians and cardiologists, who will be the first to evaluate and treat patients with arrhythmias or potentially arrhythmic problems in the emergency setting. It will also be a useful textbook for students and residents in Cardiology and Emergency Medicine.